First, the Nibali performance: His time was 16:43, which is 20 seconds slower than Chris Froome in 2012. Back then, the top 5 all went under 16:45 (Nibali himself did 16:30). Using the Ferrari method, the estimated power output is 6.29 W/kg. A group of six followed Nibali home within 25 seconds. What do those numbers mean? Once again, something I have repeated ever since I started writing on the physiological implications of performance, one cannot judge, condemn or clear a performance as clean or doped based only on numbers. So upfront, let’s get performance pixelation out the way, and also deal with selective blindness on the basis that this is worthless “pseudoscience”. For more on the concept, and the error in estimation, this is worth a read by Dr Mike Puchowicz. That said, there are things to discuss regarding the performance. First, it would easy to dismiss 6.5 W/kg as impossibly high. 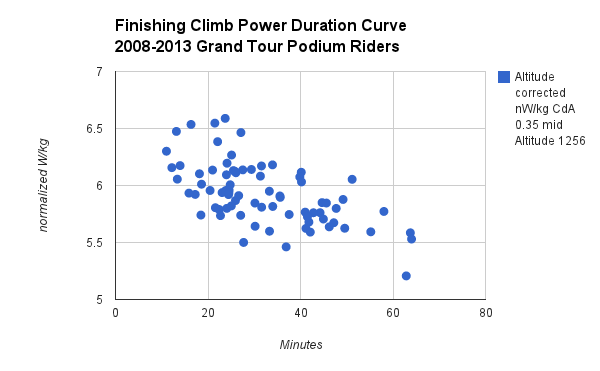 However, it’s a relatively short climb at under 17 minutes, and as the historical analysis of the Tour since 2008 shows, this is not unexpected for this duration. So what we can say is that the performance is high, but not off the charts when compared to anything we’ve seen since 2008 (this is in fact relatively obviously given that it’s slower than five men climbed it in 2012). Below is an image taken from the previously-linked article by Puchowicz. This comparison immediately raises questions exactly the same way that Froome and Quintana did on many climbs during last year’s race, where they too exceeded the historical benchmarks. In other words, what we saw today was a performance, not only from Nibali but also from those nearest him on the stage, that is at least comparable to anything produced between 2002 and 2007, the height of the doping era. 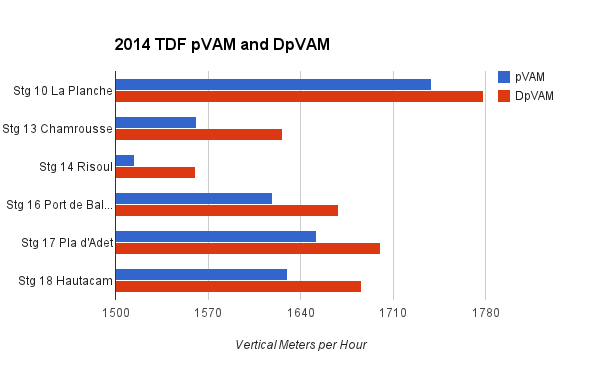 The rest of the top six on the day, incidentally, fell just beneath the dpVAM shown above, but well above the pVAM. What would also be good to add is the performance on the preceding climb of the Chevreres, because that would allow a better indication of what the RACE is doing, rather than one rider. We run the risk, just as happened last year, of looking at one performance from one rider and arriving at conclusions. Questions are good, but conclusions (or rather, hypotheses) need a little more depth. The other point I’d make is that today was a considerably more difficult stage than the equivalent in 2012, finishing atop the Belles Filles. It was preceded by a number of climbs, whereas 2012 was relatively flat (two Cat 3 climbs, though it was a longer stage by almost 40km) before an all-out effort. That should hopefully provide some context to the comparison. And finally, the tactical situation of the race, minus Froome and Contador, means we are left to wonder what may have been had they been there. Contador showed on Friday that he could stretch Nibali to the very limits, and it’s not inconceivable that he may have gone even faster today. The same for Froome, whose climbing form we didn’t get to see, but who showed at Dauphine (pre-crash) that he was more than a match for Contador. These are the ‘what-if’ questions that the two big crashes of the pre-race favorites will leave hanging as the remaining mountains are summited. More on the race situation – a broken tibia for Contador saw him abandon today, joining Chris Froome in the recovery room for broken bones. As mentioned, it’s a great shame for the race because the three-way duel between Nibali, Froome and Contador has been turned into a race of Nibali vs the rest. Add to that the crashes suffered by Talansky, and the punchiness of the race has certainly changed considerably. Where there had been the prospect of Contador attacking relentlessly to make up the time lost on the cobbles, we now have Nibali with a commanding lead, and stages that suggest he can, if desired, open that lead to render the final time-trial moot. That’s a great shame for the race, though it does invite some interest in terms of who steps up to challenge for the podium. There’s excitement for France in that Peraud, Bardet and Pinot all rode in the elite seven today, as did Valverde, van Garderen and Porte. That battle, for what seems to be the second two steps on the podium, could provide some intrigue. Unless that is, the pattern of the 2014 Tour continues, in which case Andre Greipel (or similar) could go on to win the Tour as the “last man standing”, as my colleague Dr Jeroen Swart joked earlier today. So an interesting start to the mountains, though I have to say, I could easily have repeated the same article I wrote on Facebook after the first day in the mountains in the 2013 Tour de France. On that occasion, it was Froome. Today, Nibali – you can swap the names, but the thoughts and the implications remain the same. Let’s see how the race unfolds, and then we can assess.